Buy New Olympus SH50, 16mp, 24x Optical Zoom, Touch LCD 3.0" (Black) Free WIFI 16GB & Olympus Case Malaysia At FotoZZoom! One lens for every shot. Enjoy a high-precision lens with unbelievable range. All the capabilities you need in one compact lens that won’t weigh you down. The 24x optical zoom gets you amazingly close to the action while the 25mm Wide-Angle lens lets you capture breathtaking panoramas and large group shots even when there isn’t room to back up. The SH-50 iHS is the first compact digital camera to be equipped with image stabilization that mechanically compensates for rotary shift as well as horizontal and vertical angular shift. 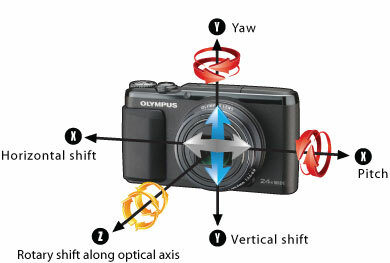 The 3-axis Photo IS uses the same driver mechanism as the OM-D to also correct blur along the optical axis. Blur-free, stable autofocus thanks to the most powerful image stabilization in its class. Even when shooting night scenes when blur is more likely to occur, you can shoot beautiful photos holding the camera in your hands. When the shutter is released, multiple images are shot simultaneously and merged into one photo with less noise in low light situations. When the flash is enabled, you get optimal exposure of both the foreground and background resulting in stunning low light images. The Olympus SH-50 iHS is the World's first digital compact camera to employ five-axis stabilization for video recording. This ground-breaking image stabilization technology that migrated down from the Olympus E-M5 system compensates for blur that occurs across 5 directions on three separate planes of motion: angular, transitional and rotary. By combining a powerful mechanical and electronic hybrid video stabilization, you'll record smooth, clear videos even when walking or enjoying a boat ride. Specifically designed to provide enhanced control when shooting videos, the Advanced Movie Mode allows for the easy activation of different recording functions like Photos-In-Movie, 60i Movie and High Speed Movie. Control your frame rate, make white balance adjustments and even set the self timer right from easy-to-access menus. Camera and camcorder all at the same time. Capture multiple photos in full resolution while simultaneously recording Full HD videos without interruption. 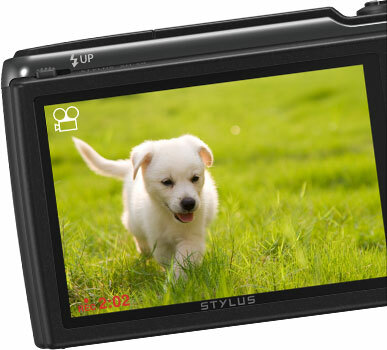 Simply press the shutter button to shoot stills in video mode - no need to change the model dial! Want more control over your image output? Adjust ISO settings, shutter speed and aperture with ease while viewing the expected results on screen as you make your selections. Intuitive touch-screen functions allow you to set your focus point and fire off the shutter button with incredible speed so you never miss your shot. And with the on-screen Live-Guide feature, you can make adjustments to color and tone right on screen. Capture beautiful close-up images of subjects at a distance with the tele macro function which allows for blur-free shots up to 40 cm close even at the telephoto end of the zoom range. Automatically compensates for shadowed areas to minimize the differences in highlight and lowlight areas resulting in more uniform exposure across the image. Get the results you want every time with Live Guide! Seeing the results before you shoot can change the way you take a picture. Easily adjust the brightness, color, vividness, etc. by touching the guide bar and previewing the effects on the ultra-bright 3.0" Touch Panel LCD. 3-axis sensor-shift image stabilization, 3" touchpanel LCD, Full HD movies, High-speed video, Advanced Shadow Adjustment Technology, HDR Backlight Adjustment, 11 Magic Filters. Available in black or silver.